I'm highlighting this book not because I've read it (which I haven't - it's entirely Latin), but because it exemplifies an interesting historical trend on Noah's Ark. In 1554, a French monk named Johannes Buteo published a pamphlet that attempted to analyze the logistics of Noah's Ark, its structure, how it was built, how many animals it carried, how much room was available for supplies, etc. This was the first of many such studies that applied newly invigorated sciences like natural history to the understanding of scripture. Even though his name is nearly unknown, Buteo's accomplishment was quite remarkable. Ideas he introduced (like the box-shaped ark) are still with us today. You can get a copy of his pamphlet in Latin and English translation in the CORE Issues series. Buteo's work spawned a number of followups over the next hundred years or so, including works by Drexel, Anglican bishop John Wilkins, and perhaps most famously (or infamously), Athanasius Kircher. 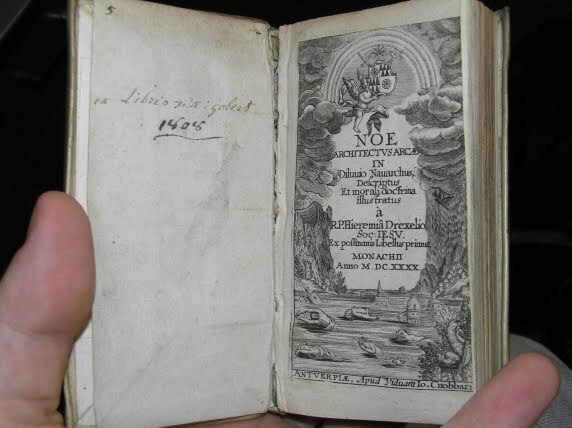 Kircher's 1675 book Arca Noe is the subject of an entire appendix in Don Cameron Allen's The Legend of Noah. Allen describes Kircher's work as quite imaginative. For example, Kircher claims that God told Noah, "I shall send my tutelar and ministering angels to you, and they will direct you and protect you from the malign efforts of demons who are plotting against you." Other parts of Kircher's work were more reasonable. He lists 160 kinds of beasts and snakes to be cared for on the ark, and he calculates that the ark had enough room for three hundred 6x6x10 cubit stalls on one deck alone. This would be more than adequate for his list of critters. So what's the point? There's a pretty common claim out there that creationism is a modern aberration, that we're just twentieth-century fundamentalists or nineteenth Seventh-day Adventists. Supposedly, Christians didn't used to interpret the Bible like we creationists do. That is utter hogwash. There have been many different ways of interpreting the Bible over the years, but to say that the straightforward reading of Genesis as history is a recent abnormality is to betray complete ignorance of history. There were plenty of scholars over many centuries who understood the book of Genesis as a real historical record. Drexel is just one more face in a vast crowd of what we now call creationists. Check out Drexel's book at Google Books.